They could really at least say if there are some new features in the update or is it just a patch/fix. I missed the information that in the previous update the internet sharing feature is added, i mean, they should really inform us if a feature that important is added. I love my windows phone more and more every day! how ’bout you (I’ll just pretend that someone reads this blog and ask the question anyway)? I have just stumbled on a nice tutorial on how to implement infinite scrolling in Silverlight, check it out! Developers can update to Mango RTM without falling back to NoDo! To be honest, this news has made me say: “way to go MS devs” for the first time in my life! fall back to the backup taken at the beginning of the provisioning process. holding right click and scroling in Google Chrome resizes only the text on the page you are viewing? 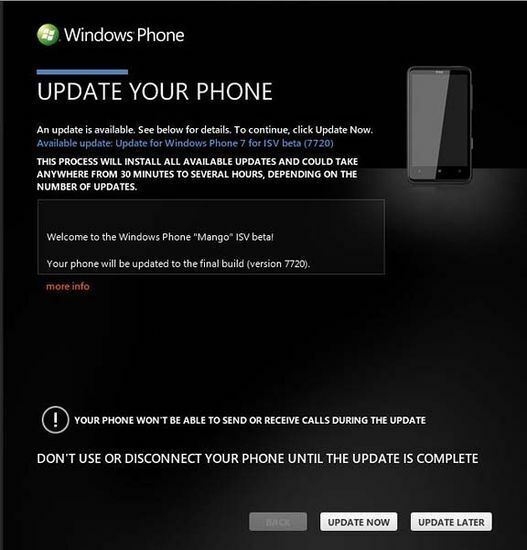 Modifying the previously released WP 7.0 version of the app is not possible once the Mango version is released! Recently the folks from MS answered a very frequently asked question, and their answer is copied below. The WP 7.0 version of your application will remain available to all users on WP 7.0 devices. The WP ‘Mango’ version of your application will be available to all users on WP ‘Mango’ devices. WP 7.0 users who have installed your application, but not updated to WP ‘Mango,’ will not receive an update notification. The WP7.0 rankings & reviews that your application received will attach to your new updated WP ‘Mango’ version too. The application metadata and screenshots for Windows Phone Marketplace submitted with the WP ‘Mango’ version of your application will be shared across both the WP 7.0 and WP ‘Mango’ versions of the application; i.e., a single set of metadata and screenshots will appear to both WP 7.0 and WP ‘Mango’ users. Once you have released the WP ‘Mango’ version of your application, you will no longer be able to modify the previously released WP 7.0 version of your app. We realize that some of you may worry about this limitation, and so we’re actively working on ways to mitigate it. To improve the experience for users, it’s our preference not to have “duplicate versions” of your apps in the marketplace. We are also going to work hard to encourage our pre-existing users to enjoy the free upgrade to Mango as quickly as possible. As you can see, we have a problem here! There is no way to update a pre-mango release after you have released the mango update! Since the majority of users still haven’t updated to Mango there is a need for frequent update of the pre-mango versions. There is a workaround though, you can publish the pre-mango app which is using mango components if the app detects that the mango is available on the phone! This is done using the reflection, so if you are interested, knock yourselves out! Read more about it! Don’t you just hate when you have to write all this code over and over again for every single DP you need? You probably already know that you cant serialize Brush objects using Isolated storage default serialization engine, so there are a few ways you can overcome this simple problem. There are a few approaches to solving this problem and some of them include serialization of brushes Argb byte values, or brush Color values. I’m gonna show you how to create a simple serializable class in order to overcome this problem by serializing brushes Color. /// Initializes a new instance of the BindableBrush class. I have just realized i need to change my layout! Most of the source code I’m sharing with you can’t fit in the same line so i think i need to widen the main column by at least 30%.. There is only one way to close the SIP (Soft Input Panel) by default in Windows Phone 7, and it is by changing focus from the TextBox that is being edited to something else on the screen. As an android user, I am used to close it by hitting the enter key once the text editing is done so I’m gonna show you how to do it and hope it will become a practice. What we need to do here is change the focus to something other than the TextBox we are currently editing, and for that purpose the PhoneApplicationPage that contains this TextBox will do just fine. All we have to do first is make this page a TabStop so we can enable it to recieve the focus. Next thing to do is add the KeyUp event handler to the TextBox and implement it. And that’s it! The SIP is now closed when Enter key is typed in! Hope you find it useful.. There is a simple solution to the code posting problem in blogger.